Under the leadership of the Board of Directors, Radius Child and Youth Services initiated a strategic planning process to enhance the capacity of the organization to achieve our mission. Youth, employees, contracted consultants, community partner organizations and funders were invited to participate in the process and provided their valuable feedback. Radius Child and Youth Services will partner with children, youth and families to inspire resiliency and contribute to healthy development through deepening our commitment to youth/family-centered approaches, improving access to services and pursuing purposeful collaborations and partnerships. To embrace and reflect youth/family-centered approaches in the delivery of services. To ensure access to service by youth and families is timely. To build the capacity of Radius Child and Youth Services to serve more children, youth and families through purposeful partnerships and collaborations. 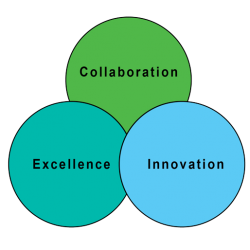 Radius Child and Youth Services will continue to inspire excellence by reflecting evidence-informed practices in all that we do, advancing innovative service delivery approaches and realizing a culture of continuous learning through research and quality improvement. To reflect evidence-informed practices in service delivery. To pursue research opportunities that directly improve the relevancy, responsiveness and/or quality of service delivery approaches for children, youth and families experiencing trauma as a result of abuse and/or neglect. To promote excellence through quality improvement and accreditation. Radius Child and Youth Services will foster possibilities for children, youth, families and communities by fostering engagement by demonstrating effective leadership and stewardship. To foster engagement in the planning, policy development and decision-making processes of the organization. To ensure future sustainability through effective stewardship. Interwoven throughout this strategic plan are three dimensions that define our context. Collaboration: Fostering purposeful partnerships to achieve our mission. Excellence: Being the best at everything will motivate our actions and decisions. Sustainability: Demonstrating effective stewardship of resources to preserve our future.